Hello and welcome! 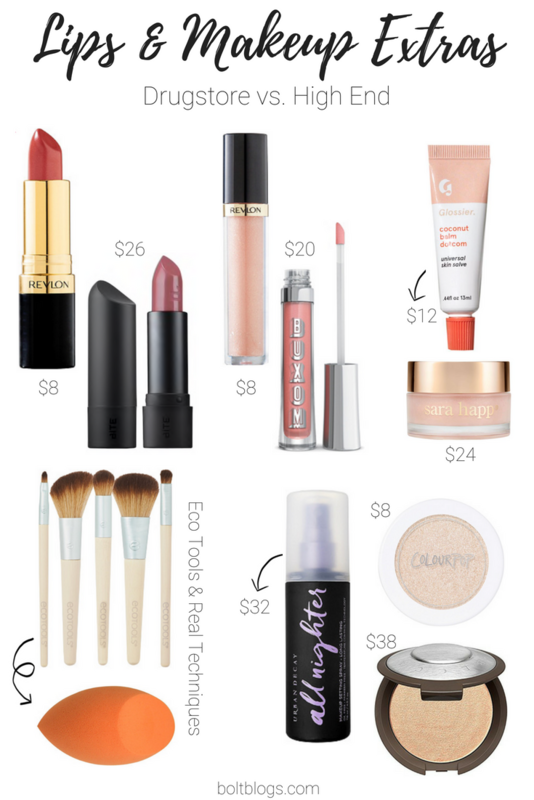 This was an unplanned blog post but I am super excited to round up my FAVORITE makeup items! 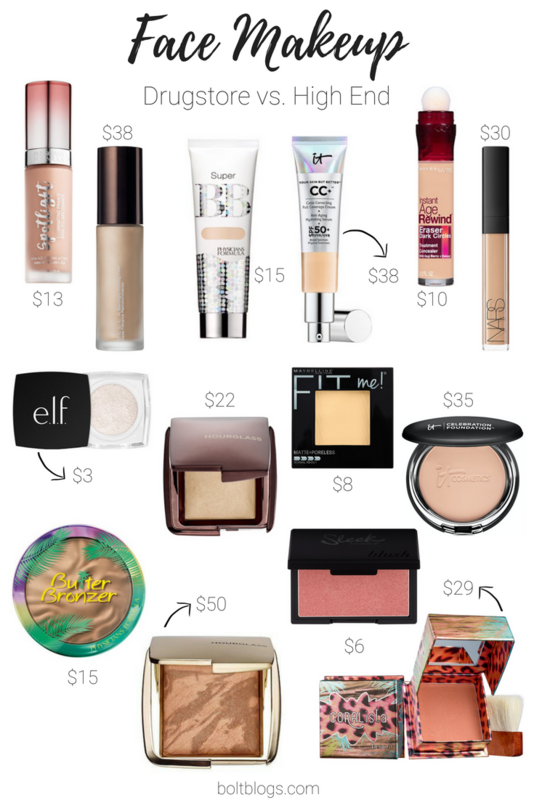 I had a friend ask what makeup she should get if she was going to start from scratch, which really got me thinking about my absolute must-haves. Primer: Physicians Formula Spotlight Illuminating Primer ($12.99) vs. Becca Backlight Priming Filter ($38) – Both of these primers are going to give your skin a gorgeous healthy glow, perfect for no-makeup looks in the summer. Base: Physicians Formula Super BB Cream ($14.99) vs. It! Cosmetics CC Cream ($38) – The only problem with the Physicians Formula is that it only comes in two shades. It’s slightly thicker than the It! Cosmetics, but overall, a great dupe. Concealer: Maybelline Instant Age Rewind Concealer ($9.99) vs. Nars Radiant Creamy Concealer ($30) – If I was being picky, I’d want both. I prefer the Maybelline for my under eyes and the Nars for my face but both are amazing. Under Eye Setting Powder: e.l.f. High Definition Undereye Setting Powder ($3) vs. Hourglass Ambient Lighting Powder Diffused Light ($22) – General makeup tip: buy travel sizes to save money! Since I only use the Hourglass powder for my under eyes, it makes sense to buy the mini. Face Powder: Maybelline Fit Me Matte + Poreless Powder ($7.99) vs. It! Cosmetics Celebration Foundation ($35) – Both of these are fabulous full-coverage powders. To use them as a setting powder, just use a large fluffy brush and a light hand. Bronzer: Physicians Formula Butter Bronzer ($14.99) vs. Hourglass Luminous Bronze Light ($50) – Both bronzers give you a glow without looking shimmery. Blush: Sleek Rose Gold ($5.99) vs. Benefit Coralista ($29) – A coral, golden-glow that looks flattering on all skin tones. Eyeshadow: Neutrogena Nourishing Long Wear Eyeshadow Mink Brown ($10) vs. Too Faced Chocolate Bar Palette ($49) – The only thing missing in the Neutrogena quad is a matte transition shade but the formula of these shadows is incredible. 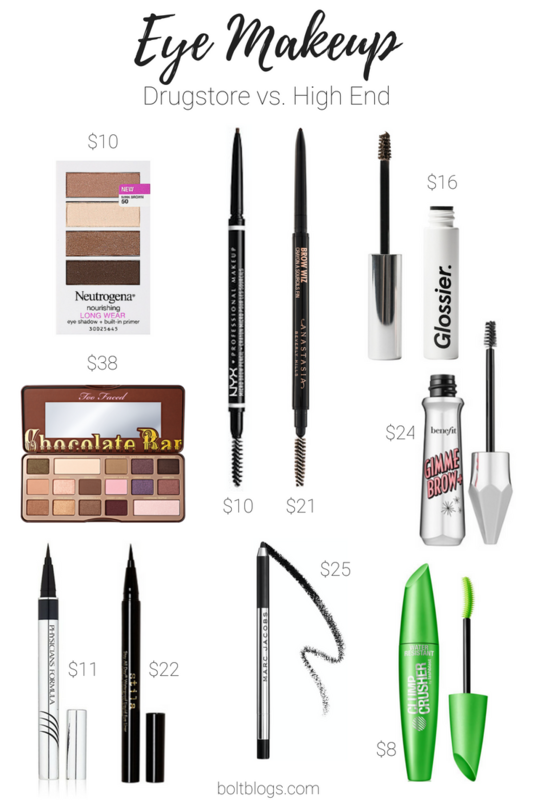 Eyebrow Pencil: NYX Micro Brow Pencil ($10) vs. Anastasia Beverly Hills Brow Wiz ($21) – While I haven’t tried the NYX pencil, NikkieTutorials says that it’s great, so if she likes it, must be great. Setting Gel: Glossier Boy Brow ($16) vs. Benefit Gimme Brow ($24) – Boy Brow is my tried and true, but Benefit just introduced a slew of new shades if you have a finicky undertone to your brows. Liquid Eyeliner: Physicians Formula Eye Booster Eyeliner ($10.99) vs. Stila Waterproof Liquid Eyeliner ($22) – Both of these are great liquid eyeliners that don’t smudge on me. The Physicians Formula isn’t as pigmented, but is a great drugstore option. Pencil Eyeliner: Sadly, I don’t have a drugstore option for this category. The Marc Jacobs Highliner Gel Eye Crayon Eyeliner is the only one I have found that doesn’t smudge on me. Plus, they have mattes, shimmers and satins in a bunch of colors. Mascara: CoverGirl Clump Crusher Waterproof. I would take this baby over any other mascara on the market. It’s not waterproof, just water resistant, and comes off with my normal face wash, no tugging required. Lipstick: Revlon Super Lustrous Lipsticks ($8) vs. Bite Amuse Bouche Lipstick ($26) – Both lipsticks are great but if you can splurge, the Bite Lipsticks are the best. Full coverage, super comfortable and they leave a natural stain to the lips. Lipgloss: Revlon Super Lustrous Lipgloss ($8) vs. Buxom Lip Polish ($20) – Both of these glosses are tacky, wet looking glosses so if that isn’t your jam, these aren’t for you. Lip Balm: Glossier Balm Dotcom ($12) vs. Sara Happ Lip Slip ($24): I can’t really choose between the two. I have 4 of the Glossier Coconut staged around my apartment and wear the Sara Happ almost every day at work. It’s glossy goodness. Brushes: Real Techniques and EcoTools, all day every day. There are also some e.l.f. brushes I really love. You can read more about my brush favorites here. 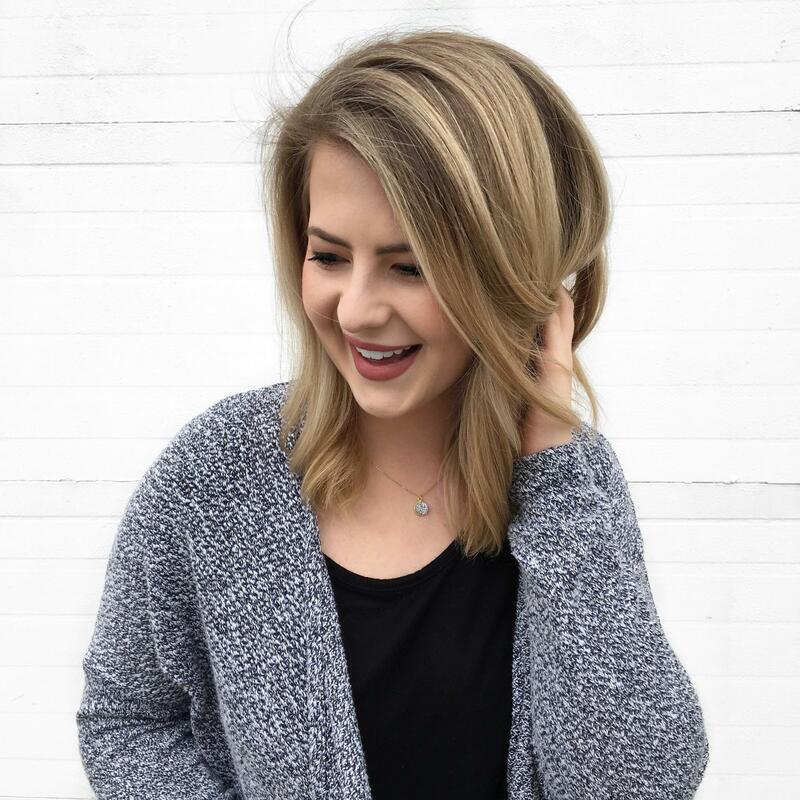 Setting Spray: Urban Decay All Nighter. I’m done trying to find something better. Highlighter: ColourPop Super Shock Highlighter Flexitarian ($8) vs. Becca Shimmering Skin Perfector Moonstone ($38) – If you have both, layer and blind the b!tches. You can also get the Becca in a mini for $19. If you’re still here, yay! Those are my all-time favorites and I’d love to know, what are yours? Have to take the Maybelline concealer ant eh Sleek blush to test!